The right conveyor system can improve your line's efficiency and productivity, leading to a stronger ROI for your plant. From highly configurable standard conveyors, to custom conveying solutions, to belt and part replacement, you'll find the right fit for your line with Dorner. 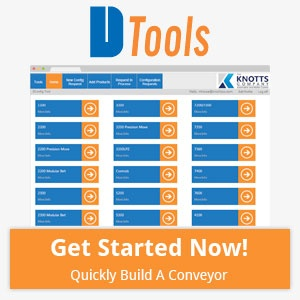 The Knotts Company has Product Specialists and Sales Representatives trained at Dorner's facility who can help you choose the correct conveyor for your application. Dorner has a conveyor that will fit your industry. Dorner's Engineered Solutions unit provides customized conveyor designs for your specific application that leverages years of collective experience and skills. With full service and support from start to finish, Dorner's engineers are able to produce custom solutions for your conveying needs, from conventional roller conveyor design to custom stainless steel systems utilizing a variety of belt and pulley technology. Contact us today for more information on how Dorner's custom conveyor solutions can make your line more efficient, provide higher output, and help boost your bottom line. Interested in a Dorner Conveyor? Find all of Dorner's videos on their YouTube Channel. Conveyor Application? Contact Us Today!